Flatter the bride by giving a memorable maid of honor speech at the reception. Examples can provide the inspiration you need to help you write your own when you're mentally blocked due to the pre-wedding stress from your duties. There are two different ways to go with your speech. You can either be sentimental or funny. To decide which is best, consider the bride and what she would likely prefer. It can depend on the tone of the wedding as well. Edit the templates using Adobe Reader. Fill your own information in with the details requested between the brackets to personalize the speech you select. If you have fond memories from your youth with the bride, use the sentimental sample. This short and sweet maid of honor speech template allows you to share how you met and what the bride meant to you through the years. It also allows you to share the bride's first thoughts upon meeting her groom, something that is sure to be special to him and everyone listening. A funny speech, like the one in the template to the right, is perfect if the bride has a great sense of humor and some cute quirks she wouldn't mind you sharing with everyone. For example, you could share a couple silly stories about how the bride likes cheese snacks dipped in dressing or that as a child, she tried to make toast in a VCR. The silliness continues as you share a couple impersonal dating tidbits and how you knew it was different with the groom. 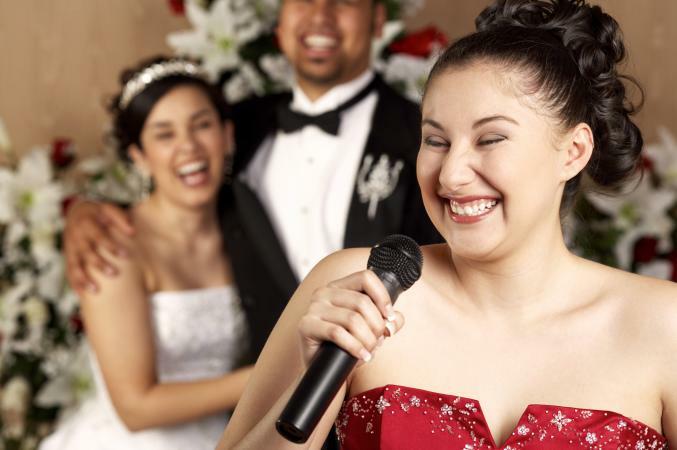 Pick this speech template if you know the bride wouldn't mind a few chuckles at her expense. Introduce yourself and state your relationship to the bride and how long you've known her. Some of the guests may not have met you before. Thank the bride for asking you to be the maid of honor. Talk a little about the couple. How did they meet? What were your first impressions? When did you realize that they were meant for each other? Start in the past and end in the future. Begin speaking of your history with her and end with a mention of her bright future with her new husband. Use a quote or a poem from someone famous regarding relationships. Finally, end the maid of honor speech on a happy and upbeat note, and express good wishes for the couple. Make your speech about five or so minutes long. It will be easier for you to remember, and it will leave enough time for others to toast the couple as well. Don't mention religion or politics unless it is imperative to the speech; for example, if the couple met at the Democratic National Convention. Keep humor PG so that you do not embarrass the bride or offend anyone. Remember to invite the guests to lift their glasses if you want to end with a toast, and don't forget to bring your own drink as well. It does not have to be alcoholic. Use a maid of honor speech for sisters if you're the bride's sibling. A short maid of honor or matron of honor toast is appropriate if you want to keep the reception moving along. A free wedding speech that personalizes things and incorporates the history of the position is appropriate. Once you've written your speech, practice it a few times before you have to give it at the wedding and ask others to listen and give their input. If you're more comfortable with it, this can help banish some jitters. Don't worry about memorizing it completely. It's perfectly fine to use note cards or even a full sheet of paper. Most likely, you will not be the only one doing so. It can be nerve wracking to be asked to make a wedding speech, but after checking out different maid of honor speeches you can become inspired to share your thoughts and congratulations with the happy couple in a comfortable and meaningful way.